Western Health Advantage (WHA) is now available in the Bay Area for large and small group employers. Our partnership with Canopy Health, co-founded by John Muir Health and UCSF, provides access to providers who are some of the most skilled and respected in the United States, and the numerous renowned hospitals and care centers at which they practice have long been recognized for their medical excellence, advanced technology, and compassionate care. For 2017, Health Net is offering a variety of health plans throughout California. 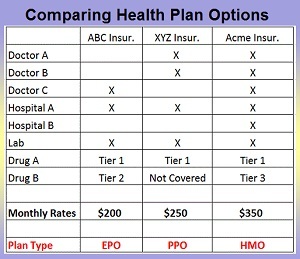 There are EPOs, HSPs, HMOs, and PPOs plans. Some of the plans are offered through Covered California and some, like the PPO plans, are only offered off-exchange direct from Health Net. Whether they’re traveling for work or visiting family in another state, your clients’ employees can be confident in Kaiser Permanente coverage. That’s because our members are covered anywhere in the world. The lessons in this module, “Medicare for People With End-Stage Renal Disease,” explain the Medicare program for people with End-Stage Renal Disease (ESRD). It includes information on eligibility and enrollment, coverage, health plan options, and provides additional sources of information.